Today Robot Wars justified just why the new rule change is so beneficial when a pain in the arse returned and went straight out. Now it’s no secret I didn’t like Gabriel in 2016. The entire high-density plastic robot was a gripe for me throughout its appearance due to the fact it had no ability to attack yet got through simply because bendable plastic didn’t break and ergo took no damage while eventually others had mechanical problems. This time however its “sit back and take it” attitude, which saw the first ever 3 minute long Carbide fight, cost it. Now the removal of the Round Robin system means it can’t hope for easy points due to breakdown as the opponent will be as tired as it is and its inability to be aggressive or damage prevents it from getting past the quarter finals. The system thereby works in weeding out bad final battles as the boring bots get removed. The other early exiter in the form of Crackers N Smash however is a clear example of a “longevity” robot that can still put out damage of its own. Unfortunately for them a very powerful flipper opponent and then Sir Killalot sitting on them helped push them out early but they tried at least. The final four, which consisted of three spinners and the flipper Eruption, all tried to go the distance but only Carbide as per usual prevailed against all others. The introduction this series of “entrapment” devices supposedly to balance the playing field against spinners showed just how useless these devices actually are. Most of the time they just got flinged off into the air as they aren’t long enough to actually get tangled up in the spinning mechanism which meant it soon descended into the usual “who can survive the most hits” contest, with Aftershock doing not too good compared to last time with it going home early this series. 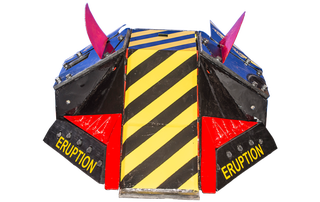 Instead coming third was Big Nipper which, despite some stability issues caused by its spinner, managed to survive Eruption and then take out Aftershock to go through the 10 way FFA along with said flipper, who once again was beaten into second by Carbide. The arena however continues to fall apart, this time with the Flipper getting shredded, and saw a controversial situation where teams believed a cease was in place as a result when it hadn’t. Someone really needs to fix this thing. Doubt that’ll happen anytime soon though, least of all not before the recording of next week’s episode.